Thirteen strangers piled into the waiting raft at Lee’s Ferry on the Colorado River. It would be our transportation for the next eight days. Adam, our guide, greeted us with his eight-month-old son on his hip. Three generations of river guiding make his family as much a part of the river as the canyon wren, the pink rattler that has taken on the rosy hues of the sandstone walls, and the aloe—sustenance to the Native Americans who have called the Grand Canyon home for 10,000 years. A wren’s lilt echoed through the canyon as we began our descent into deep time. Aquamarine waters on the first stretch of the run looked inviting but remained a bone-chilling 55 degrees for all 227 miles. The Colorado River, controlled by the hydro-electric boys at Glen Canyon Dam, was flowing at a powerful 23,000 cubic feet per second. That meant big rapids and big fun to come. We floated steadily through serene stretches that allowed for snoozing and rubber necking in between white water that woke us up with a cooling splash. The world travelers (ages 30-70) joining me on this Bucket List trip said the striated sand and limestone formations reminded them of Egypt. They saw the heads of pharaohs, petroglyphs, and a colossal sphinx staring down at us from a thousand feet above. By day two we were waking at first light watching the sun warm vermillion rock walls jutting skyward. Falling asleep to the constant conversation of the river took me far away from whatever was happening beyond the rim. While our guides prepared lumberjack breakfasts for us, I enjoyed doing yoga. Five out of seven nights on the river I slept under a dazzling Big Dipper. Warm breezes, talcum powder sand at our beach camps, and the absence of mosquitoes made this the perfect chance to get close to nature. Temps averaged about 75 degrees in the day and 55 at night. 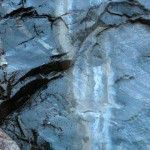 I awoke one night to a brilliant full moon illuminating the canyon walls that protectively embraced our camp. 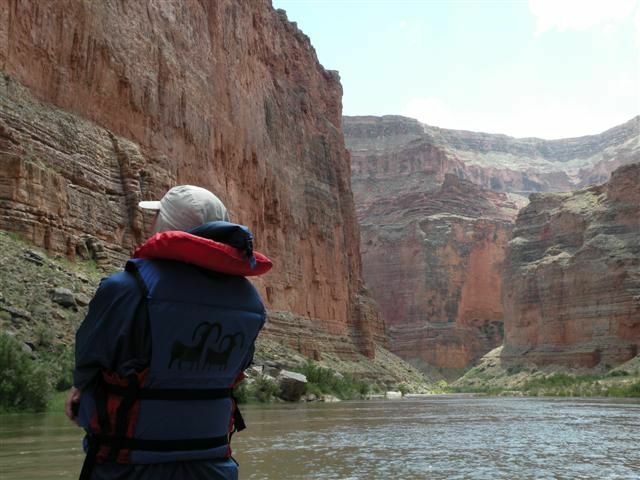 Each day we eagerly climbed back onboard our trusty craft to explore the secrets of the canyon. The purr of the engine in the background as we motored steadily along with the current was reassuring, especially in the face of headwinds that rippled flat water to chop in the afternoons. We eased through riffles and maneuvered rapids with finesse, tucked into tight parking situations, and were able to dawdle at highlights like Vasey’s Paradise. This burst of fern-bordered white water gushing from the arid canyon wall comes as a shock after miles of orange and buff formations stacked to the horizon. A stair-stepper climb from our beach camp took us to the Nankoweap granaries carved into the cliff face by the Pueblo people around 1100 AD. From here is a heart-thumping view of the curvaceous river wending its way down canyon and the delta where native peoples planted crops. 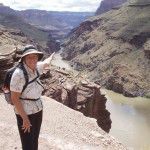 The confluence of Little Colorado River marks the end of Marble Canyon where the canyon opens up to mind-boggling expanses of cathedral buttes and stacked terraces that spread to the rim ten miles away. It is also the gateway to opalescent waters that soothe the senses after miles of formidable olive green, red and dun-colored buttes streaked with black desert varnish. We joined two other rafting groups at the water slide into a natural Jacuzzi where we giggled our way down the water chute a half dozen times. 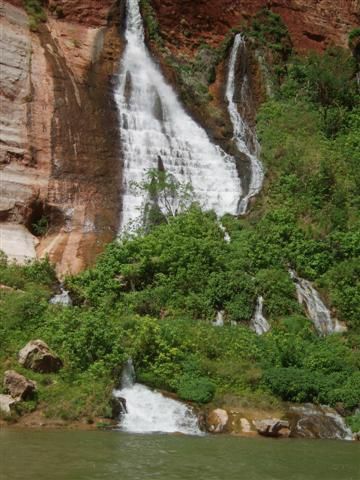 River rats go no further up this magical canyon the Hopi hold sacred. 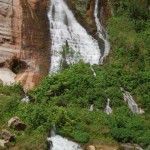 Sipapu, the navel from which they believe their ancestors emerged from a previous world and where they will return after death to the underworld, is off limits. While dinner was being prepared, I took a walk up a narrow canyon framed in dark, foreboding basement rock melded into other-worldly formations. I felt I had entered the inner sanctum of the canyon. 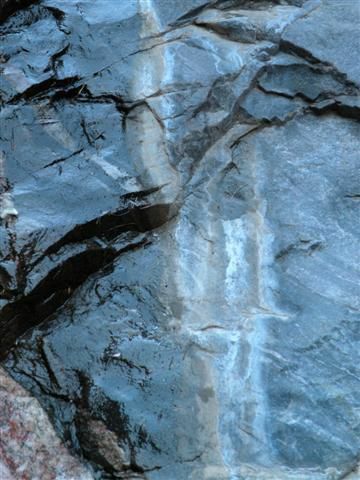 Compressed by the weight of rock above and softened by the heat rising below, the 1.7-billion-year-old formations streaked with Vishnu Schist look like marbled rock taffy. Anyone can take this trip if they have the right attitude. All you have to do is be able to get in and out of the raft. Everything else is taken care of by caring guides. 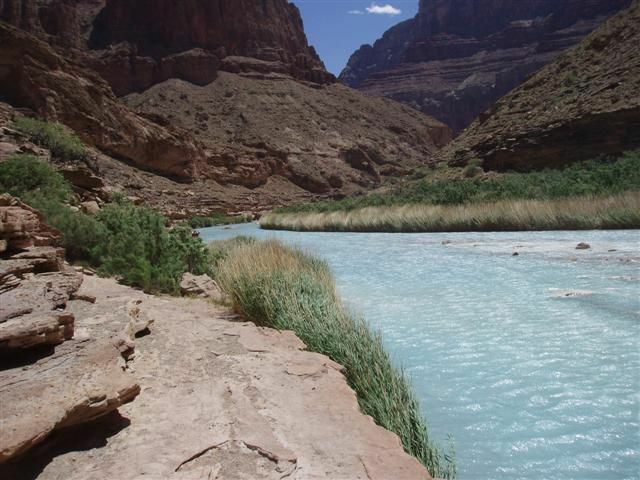 All camping gear and wonderful meals are provided by Grand Canyon Expeditions. All of the hikes are optional. I loved that we were not over-programmed. 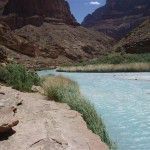 When we arrived at Havasu Creek, another turquoise wonder spilling over white boulders into swimming pools, we were sent off with our picnic lunch for a couple of hours of alone-time. I settled into my little plot in paradise, stripped to my swimming suit, and dove into the refreshing waters. My heart was overflowing with joy and gratitude to be a part of this journey into time with my new friends when I saw Scamp Raven fly overhead with my sandwich in his beak! Adam warned us about this opportunistic bird that lays in wait for careless travelers. Dangers of the desert include dehydration, sunburn, over-exertion on hikes and flipping in a rapid. 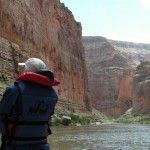 After 47-years on the river, Grand Canyon Expeditions has this trip down and can take you safely on this incredible journey through deep time. 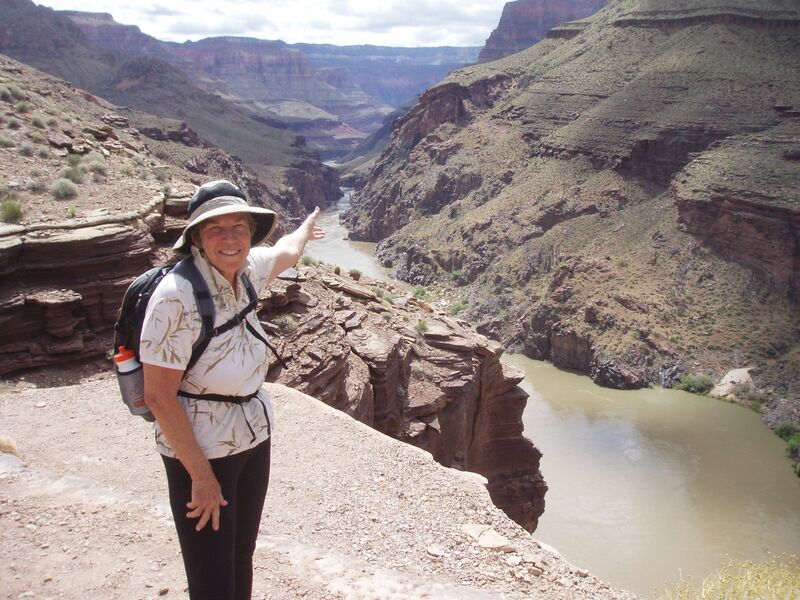 Go to www.examiner.com and search for “Linda Ballou” to view my Great Outdoor Days in L.A.